Art Fag City has some harsh words for Sonya Clark's winning submission to this year's Artprize. 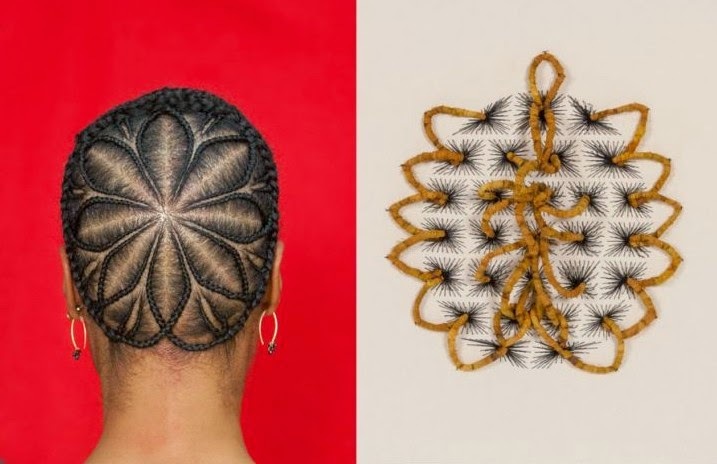 I do not approve of the Grand jury’s decision to split the grand prize with Sonya Clark’s “The Haircraft Project.” This was an entirely formulaic piece. A series of hairdressers were asked to style Clark’s hair. They were then photographed in such a way that they were merely a blurry presence behind their creation. After the shot was taken, they were asked to translate their hairstyle onto stretched canvas. The photographs were terrible. The work on stretched canvas inevitably ended up in the center. It tells us nothing we didn’t know already about women’s hair. Granted, this might not be the strongest work Clark's done but I'm not sure it's as bad as the generally negative Paddy Johnson would have you. Shamefully, I haven't yet written a post on Sonya Clark's extensive body of hair-centric work, but don't you worry....coming soon!